One of our favourite galleries Beers Contemporary is soon to present Terror Management Theory from one of our favourite artists Kim Dorland. The details can be found below. For his first solo show at Beers London, Canadian artist Kim Dorland presents ‘Terror Management Theory’, wherein the artist offers a modern-day reimagining of the concept of Memento Mori. Dorland has long explored the concept of Memento Mori, which, when translated from Latin, means ‘remember that you have to die’, and represents one of the longest standing conventions in the history of art-making. In early history, Romans of the Stoic school of Philosophy pronounced the need to face death in a steadfast manner: ‘Death smiles at us all,’ wrote Roman Emperor Marcus Aurelius before his death in the year 180 AD, ‘all we can do is smile back.’ Art history traces various religious beliefs and the paintings that accompanied myriad historical periods as reminders of the need to eschew earthly pursuits and work towards living a Godly life. This fascination with death can be traced back to as recently as the Victorians, whose Memento Mori photographs depicted the living posed next to bodies of deceased family members, like morbid curios of a bygone era. 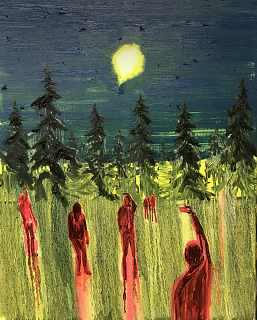 Certainly, Dorland’s trademark subject matter is once again at play: solitary figures in nighttime forests, owls gazing ominously back at the viewer, self-portraits laced with visceral ‘blobs’ of impasto paint. But there is also a playfulness in both his approach and his titling: Plein Air Painter replaces that ominously shadowy figure in the woods with another tradition in painting: the open air painter, an approach favoured by the Modernists as they watched the changing of the daylight and seasons. In Self Portrait at 44, the artist wryly mentions his age as another subtle, albeit humorous, reminder of one’s own morbitity. Have a Nice Day is perhaps the most outwardly tongue-in-cheek, referencing the currently topical ‘plastic-crisis’, the fragility of life, and the entrapments of life in a single, rather banal image. There are (not so) subtle allusions to zombification, biohazards, teenage posses, a vampire (or two), as well as a few other horror-movie clichés thrown in (haunting sunset, long-haired girl), and of course, a couple of traditional Memento Mori scenes: a skull bursting with flowers, one bright blue, and one starkly black. These two stand in as metonym for all of Dorland’s practice: at once haunting, simultaneously overabundant expressions of some sort of mania, be it gleeful or haunting, situated between extremes: the sheer rapture of artistic expression…life, and – of course – death. Kim Dorland’s works remind us of the power of nature and the impact that humanity has upon our environment. His paintings are typically inspired by the landscapes of his native Canada, as well as more traditional landscape painting and portraiture such as that explored through Tom Thomson, of Canada’s famed Group of Seven who painted in the early 20th Century. But what is perhaps most indicative of Dorland’s trademark style is a seemingly post-punk aesthetic: like glowing embers from a fading campfire, Dorland’s tableaux suggests the harsh burn-out of a long party, a suburban riot, or a torrid affair. Through their use of bright colours and thickly impasto paint, Dorland’s scenes often depict a relatively tongue-in-cheek idea of modern life versus nature: graffiti-ridden walls, bridges encroaching into the wilderness, sunrise in suburbia littered with beer bottles, or trunks of trees with expletives ‘carved’ into their bark with paint. Certainly, there is a sinister undertone to his perspective, but they are presented and levied by their sense of humor and apparent irreverence. Even his figurative work operates similarly, where portraits of friends or family members emerge almost conceptually: often through a vigorously applied mountain of paint, as though the paint were a type of metonym or stand-in for memories. Other times, faces are ghostly, shadowed or obscured behind hoods and blankets. Applying paint in a fevered, immediate manner, Dorland uses a combination of flattened acrylic grounds layered with viscerally and liberally applied oils. Lately, his approach combines ‘digital painting’ with his instantly recognizable style. These are paintings that prefer to elevate their medium – as opposed to their subject matter: Dorland has alluded to celebrated painter Frank Auerbach as a pivotal, early influence, stating he’d “never seen anything like it, the way the material looked and felt. It was sort of icky’. Like Auerbach, Dorland paints his subjects with a sense of freedom from traditional representation combined with an unsettling, almost violent immediacy. Like Auerbach, it seems to provide – for both artist and viewer – a method of exploring humanity and the uncanny while simultaneously keeping it at a curious psychological distance. 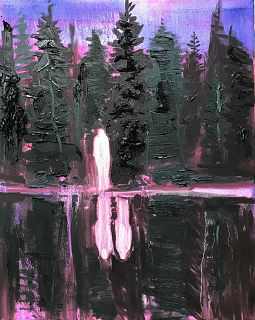 KIM DORLAND (b. 1974, Alberta, Canada) lives and works in Vancouver, Canada. He graduated with an MFA from York University, Toronto, in 2013, and a BFA from Emily Carr Institute of Art and Design, Vancouver, in 1998. Solo Exhibitions include: ‘Same Old Future’. Arsenal Contemporary, New York City (2018); ‘Nemophilia’, Equinox Gallery, Vancouver (2017); ‘Get Out’, Galerie Antoine Ertaskiran, Montreal (2017); and ‘I know that I know Nothing’, Angell Gallery, Toronto (2016). Group exhibitions include: ‘Aidas Bareikis, Kim Dorland & Bill Saylor’, Mier Gallery, Los Angeles (2016); and ‘Major Works’, Equinox Gallery, Vancouver (2016). Dorland was the Globe and Mail’s ‘Artist of the Year 2013’. His works can be found in the collections of the Art Gallery of Alberta, Musée D’art Contemporain De Montréal, The Beth Rudin DeWoody Collection, The Richard Prince Collection, the Taschen Collection and The Contemporary Art Foundation in Japan. Dorland’s first group exhibition with BEERS London was in ‘O Canada!’ (2017). He will have his first solo exhibition with BEERS London in September 2018, entitled, ‘Terror Management Theory’.